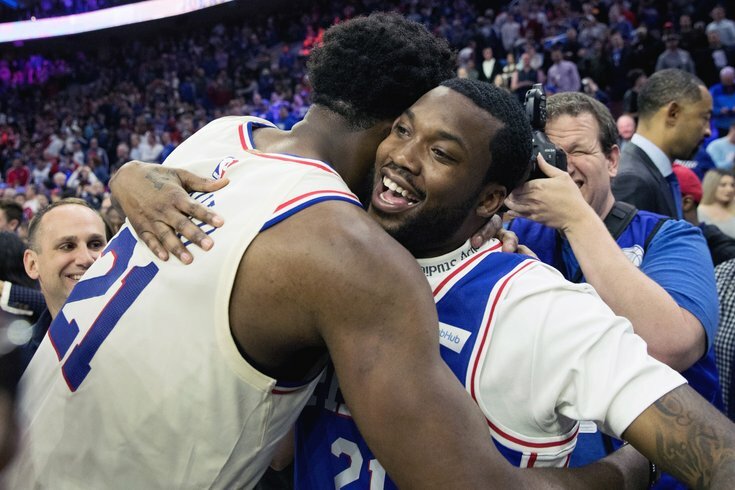 Philadelphia 76ers center Joel Embiid hugs recording artist Meek Mill after a victory against the Miami Heat in game five of the first round of the 2018 NBA Playoffs at Wells Fargo Center. Five years after hiring the man who kickstarted the rebuild, four years after selecting the franchise center and the hard-nosed Euro who would help lead them forward, and two years after finishing a season with a 10-72 record, Sixers guard JJ Redick stepped to the free-throw line with 3:48 to play and the Sixers' series victory in little doubt. As he knocked down both shots to push the lead to 13, a familiar chant echoed around the Wells Fargo Center. "Trust the Process! Trust the Process! Trust the Process!" Tuesday evening's 104-91 victory over the Miami Heat was a lot of things — a welcome home party for Meek Mill, the possible last game for future Hall of Famer Dwyane Wade — but above all else it was the culmination of thousands upon thousands of man hours put in by two separate regimes, dozens of players, and a city desperate for a relevant basketball team again. There would be no more wishing, no more counting on ping pong balls, only a victory when the final horn sounded. Those fans at the Wells Fargo Center have not forgotten. And just like the players who have pushed this program forward, they have embraced the idea of believing in and valuing the journey it takes to reach real success. The payoff has arrived, and not a moment too soon. There are not many things that can overshadow the Sixers' play on the court these days, but the return of the author of the Eagles' Super Bowl soundtrack came close on Tuesday afternoon. Meek Mill got his long-awaited release from prison with the help of some powerful friends, and with some helicopter assistance from Sixers part-owner Michael Rubin, the rapper's return home was the talk of the city for the hours leading into the game. But then the Sixers had to actually go out and play, and for a while there it looked like a return trip to Miami might be necessary. As they've done all series, the Heat hung around through the first 24 minutes of play, junking the game up with a lot of physical play. The officials were happy to let players get away with tons of clutching and grabbing to an almost comical level — baskets were scored as jerseys were being visibly pulled in the opposite direction, and the officiating crew decided they were content to swallow their whistles. Even the rougher stuff was punished loosely compared to normal. Ben Simmons was undercut by Heat wing Josh Richardson and took a scary fall in the game's first couple minutes, and the officiating crew opted not to take a second look at it with a review. It probably ended up being the right call — it looked like Richardson lost his footing after being bumped by a teammate — but typically when a foul results in that sort of spill you're at least getting a brief rewatch of the tape. As it has all series, a rough-and-tumble game where guys can get away with more than usual benefited the Heat more than it did the Sixers. But as it also has all series, the second half saw the better and more talented team shut the door, ultimately earning the victory. "You can lose with effort, and you can lose to a better team. And that's what they were, that's what they are," said Dwyane Wade after the game. "Ultimately we played with the effort we needed to, they just had more than us." This group is a team in every sense of the word. Though guys like Marco Belinelli have gunner tendencies, ultimately there is no one on this roster who believes they are bigger than the collective. And so you have moments throughout the game in which starters and bench players combine to create beautiful basketball, the product of their collective willingness to work toward a greater good. "I think we have a special team," said Joel Embiid after the game. "We've got a lot of talent and all good guys. We love each other and love playing with each other. I feel like we play the way we want to play and that's sharing the ball. We're the best defensive team in the league. We feel like we're unstoppable and we can get whatever we want to." The truth, as always, is stranger than fiction. They do not make many players like Ben Simmons, the wunderkind who took the league by storm this season. Lesser young players would have folded against the pressure Miami put on him in Round One, buckling under the physicality. The Heat did not let up against him in the final game of the series, with Goran Dragic even going so far as to smack him in the back of the head in the third quarter. Simmons did what he usually does in these heated moments — he showed very little emotion and walked away, choosing not to get involved in the extracurriculars. Once play resumed, he did what he has done all season, going back into the teeth of Miami's defense in order to set up a Robert Covington three from the corner. It is hard to say enough about the composure and purpose of Simmons' play, the pursuit of success never sidetracked by on-court beef or shenanigans. If his talent is beyond his years, his demeanor and consistency are even more so, which Wade was happy to note as he addressed reporters after the game. "I don't think he had a bad game. A young player like that in his first playoffs, he didn't have a bad game," said Wade. "You knew from the first time you saw him in Summer League that he was special. If you knew basketball, you know talent, you know someone's special. And the first time I saw him in Summer League, I said OK, he got it. The thing that was impressive with him all year is he just continued to get better and better, to the point where it's like that guy in Cleveland [LeBron James]." This is not the first time (or really anywhere close) that someone has compared Simmons to his mentor, but it takes on a little more significance when it comes from the mouth of a guy who played with LeBron in his prime. Wade was the co-pilot in LeBron's run of dominance with the Heat, and to hear him talk about Simmons in that way should speak volumes about where this kid is heading. Ever so slowly, the weaknesses in Simmons' game are beginning to fade out of the picture. Following a 6/7 night from the free-throw line against Miami, Simmons wrapped up the five-game set shooting 71.4 percent from the stripe, a number that would warrant cartwheels and backflips from the organization if it's sustainable. Simmons may never be a successful jump shooter, but if he turns into a decent free-throw shooter, there is no way to stop him from becoming one of the best players in the NBA. Already, we are witnessing a level of offensive versatility you just don't come across very often. In addition to orchestrating the offense as the ballhandler, Simmons' size and background as a power forward have been shining through more and more lately. It's a trip to see Embiid throwing someone else entry passes on deep posts or for Ersan Ilyasova to be involved in a lob play, but Simmons distorts standards with his play. The dust has settled on this one, and Simmons wrapped up his first playoff battle with some downright comical numbers: 18.2 points, 10.6 rebounds, and nine assists per game on 50 percent from the field and 71.4 percent from the line. Add on almost 2.5 steals per game, and you have one of the best opening stanzas to a rookie career imaginable. He is tough, he is calm, and he has proven ready for this moment so far. For the players that have been here the longest, the gratitude for making it at all was evident on their faces in the locker room after the game, almost taken aback by what had transpired around them. Asked by The Athletic's Rich Hofmann about being part of the transformation from 10-72 team to 52-game winner and playoff victor, T.J. McConnell offered up the most honest reply of the night: "That was a hard fought 10-72, by the way." Being the longest guy here, playing through all the rough years, seeing us in this moment is exciting. Truly thankful to be here still through all the rough years, but it's a testament to hard work and staying with it. I've been through moments my whole career, I've experienced losing and winning and I knew it could take time to get there, you just got to stay with it. Happened to me in my high school career, happened in my college career, so just seeing how everything's playing out after a few years of roughness, this is another chapter in my journey. Never lose faith, never lose courage. Even within this season, those were words to live by. The Sixers hit roadblocks along the way, sputtering through a rough December that had them trailing the New York Knicks in the standings, and struggling to put away games in second halves after opening up big, early leads. The perseverance that built this program over years was necessary to get them over the hump in this single season, process paying off with results at long last. Seeing cameras surround Covington's locker on Tuesday night was surreal, knowing what he alone had been through. He has been crushed and booed by fans, subjected to blowouts and harrowing experiences, and has emerged on the other side as one of the vocal leaders of the club. He fights for every inch, and his teammates follow suit. No one embodies that fighting spirit and ability to overcome like their head coach, who survived that ugly period of basketball and a whole lot of critique about the job he has done even up through the midpoint of this season. His work is far from complete, but the Sixers have his handprints all over them, the team culture and preparedness a credit to him and his staff. "The coaching staff established it earlier before we even started the season. Guys came in I think for Labor Day, and everybody, the whole team came," said Amir Johnson, who joined the team as a free agent last offseason. "[The coaching staff] have been very detailed in everything that we do. They hammer us with our coverages, our offense, our defense, every day before practice. It starts, we come in like two or three hours before we hit the court, we just go do film." A team's culture goes so far beyond what the day-to-day results are on the floor, and the Sixers are living proof of that. Even in that (hard-fought, of course) 10-win season, Brown's players always showed up ready to fight and play for their city, which reflected a belief that what they were working on was worth something. There have never been any rumors of discord with the coach, no veiled shots in the media, only a culture of respect between players and coach that has allowed them to survive when the going gets tough. That is something to treasure because it is not something every organization is fortunate enough to have. And the players made sure their coach got to feel the love when they gathered around him after the game. The opposing coach joined in the victory shout-outs after the game. "I would like to start by congratulating Philly, Brett Brown and his staff, and the players," said Erik Spoelstra. "They played very good basketball and clearly deserved to move on. They've done it the right way and built it very steadily without skipping any steps. You are seeing the benefits of gradual incremental work behind the scenes. It's always tough to lose, but they played extremely well." Any longer preview work will have to wait until we find out who the Sixers play in the next round, which could be known as soon as Thursday evening. The Boston Celtics are the odds-on favorite for now unless the Milwaukee Bucks can win the next two games in that series, including a potential Game 7 on the road. But on a broader scale, this feels like a group whose work is just getting started. Their goals have continued to shift throughout the year, from playoff team to homecourt advantage to making it out of the first round. Now they are at a point where there is no reason to put a ceiling on what they can accomplish, no justification to saying, "They're still too young to get it done." The Sixers will not accept that line of thinking, and even their adversaries believe they should not settle for anything less than greatness. "It definitely can happen right away when you have the right group around, certain individuals," said Wade. "Ben is an unbelievable talent, and they have the right guys around him. Signing JJ, bringing in [Marco] Belinelli, bringing in Ilyasova, having Joel healthy for the majority of the season and getting to play with him for the full year. They did a great job, they built a great team. When you have great individual players, it doesn’t matter how old they are, they can do some special things." "If somebody underrates those guys, they are in trouble," added Heat guard Goran Dragic. For a couple days at least, the Sixers have earned themselves a chance to rest their legs and let everybody else around them sweat it out. They are the pacesetter for the conference, the only team thus far to take care of business and advance. The Sixers will likely show reverence for whoever they end up facing in Round Two, but the fans had no such preference on Tuesday night. As the hometown team wrapped things up against Miami, one corner of the arena made sure to spotlight one of the city's oldest rivals as their preferred matchup. "We want Boston! We want Boston! We want Boston!" Sixers fans just might get Boston. And regardless of who they play, the team and its fans have every right to believe they should fear no challenger in their conference.